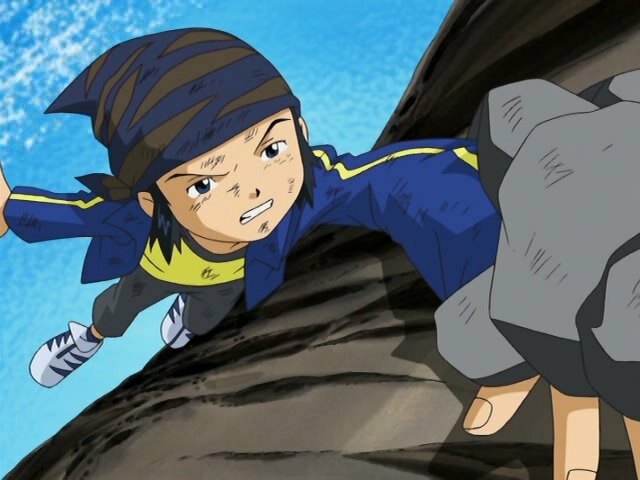 In this episode, Koji discovers that teaming up with a pile of rocks is more productive than working with the rest of the group. Our lead-in to today's adventure is a message Koji receives on his D-Tector telling him his beast spirit is nearby, but that he has growing to do before he earns it. That tells me that this episode is going to be one of those crappy “kid gets new evolution after overcoming character flaw” affairs. For much of the episode, it looked like this was what we were getting. Then a couple magical things happened and a dull routine episode did a slide evolution and suddenly became... well, respectable enough. After receiving the message, Koji bails on the group and seeks it out himself, something everybody except Takuya and company should have expected. It's still pretty presumptuous of Takuya to believe that Koji was going to be a permanent party member just because they got caught up in a mess together and were heading in the same direction. The moment Koji's objective changed, he was gone. At least Takuya is starting to recognize Koji's M.O. and only chases after him because Bokomon and Neemon took it upon themselves to follow him. God forbid they try to make progress without the essential contributions of Bokomon and Neemon. Bokomon and Neemon aren't the only ones to annoy Koji, as he soon comes across a spunky Gotsumon and tries to dog him for information. Gotsumon is irritatingly eager, but his heart's in the right place. He's trying to assemble the Shrine of the Silver Monkey (or whatever it is) to claim a spirit and become a hero. The rest of his tribe seems content to let Grumblemon eat their homeland. Despite their rocky introduction, Gotsumon and Koji save each other a couple times and, despite being used to working alone, find value in someone having your back. Gotsumon's presence ends up being nice as it allows Koji to learn to appreciate help with a bit more subtlety. It's never stated, but Koji has to appreciate Gotsumon's efforts to gather the jewels for the shrine, not to mention saving his life twice. It also allows Koji to learn this without doing something rash like respecting the other kids. It's here that the show could have taken a radical direction, adding new life to the cast by adding Gotsumon as a permanent support fighter. 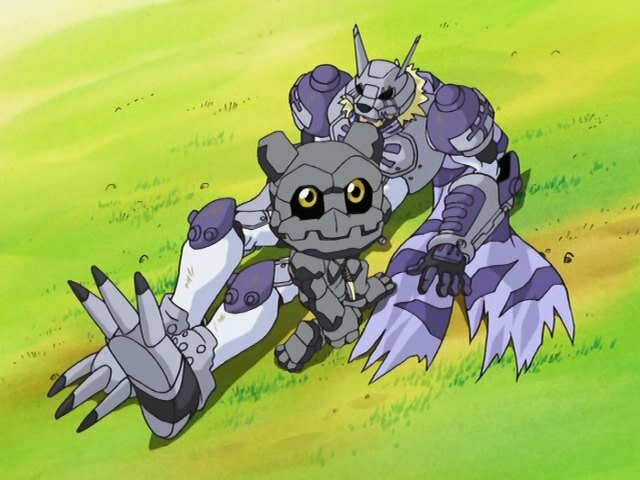 Any criticisms of forcing a limited human cast to carry a series without Digimon partners would have been silenced by building a nice little Digimon army to back them up. Given what they're up against, it would have made a lot of sense, and it sure as hell worked for Mimi and Mikey. It's a cool little bond these two have, but what salvages the episode are two more surprises regarding the spirits. 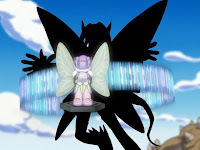 After dealing with Lobomon the first time, Gigasmon manhandles the other four digidestined and, in the midst of a juggling combo, steals Zoe's spirit of wind. That's something to wrap your head around- a bad guy exposes your source of power and OM NOM NOM! It creates a cool bit of gamesmanship in the next few episodes as the team gains and loses assorted spirits. It also ensures that the spirits are treated as tangible objects that can be lost as opposed to the crests and digieggs that are earned for good once found. But of course, the real eye-opening moment is Koji struggling to control new beast evolution KendoGarurumon. Everything down to the transformation sequence itself looks painful, and it shouldn't be surprising that Koji would have trouble learning to operate as a giant quadruped. While there isn't much of a consequence to his control issues other than Gigasmon escaping, it makes us all look forward to everybody else dealing with their new evolutions. Plus it's about time we saw these kids seriously shaken up by the whole “being a Digimon” thing. They've made it look too easy. Yes, we're calling him Mikey now. This is a dub-centric blog. Deal with it. Bokomon refers to Koji's message as an e-mail, which doesn't sound right since the D-Tector doesn't appear to display text and gives only audio messages. As an alternative, can we call these messages d-mails instead? Comic Sans makes its unwelcome return on Koji's note. It's obviously meant to create the impression of handwriting, but I'd wager Koji's handwriting would be a lot closer to Verdana Bold. It would be really easy to laugh at Zoe for losing her spirit, but since it happened while saving Kumamon, she gets a pass. So wait... Bokomon had no clue about the beast spirits before, but he has information on KendoGarurumon in it now? Even though they're in two completely different roles, I seriously struggle to differentiate the Gotsumon in Frontier with the Gotsumon in Data Squad. Not fond of the idea of making two Gotsumon minor recurring characters in consecutive series. Completely agree with bullet 5! I was pretty surprised by Gotsumon in Frontier and his similarities to Savers version. I think overall both are pretty different. Gotsumon in the second half of Savers is similar but in the first half he is a way different and pretty unique character. The thing that irks me is that both double-digivolve to Meteormon! 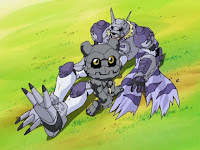 In the entire history of the franchise I think only Keramon to Infermon in Our War Games was the only time double-digivolve has ever happened so it is pretty special, even the protagonists hardly do it. In savers they mentioned how it was a big deal but Frontier doesn't have levels (I hate that) so skipping Icemon was played off like nothing. Plus it didn't help that just a few epps earlier they had other Meteormon that the dub incorrectly labeled as Gotsumon! But I guess I am getting way ahead of myself and should wait till your blog gets to those epps. This was a great episode.I really like Grumblemon,so seeing Gigasmon owning the team was great fun.My favorite part was when the kids evolved off screen and you saw tthe glowing through the smoke. -Zoe doesn't find trouble, trouble finds her. -Guess you got demoted to standing eye-candy, Zoe girl.